In two years from now as many as 225 million people may be using Apple Pay on mobile devices, according to research estimates published on Monday. By 2020, the "OEM pay" market — meaning platforms like Apple Pay, Google Pay, and Samsung Pay — should hit 450 million users, Juniper Research said. The firm specifically noted it's expecting half of these people to be using Apple Pay, despite the broader global popularity of Android phones. "We believe that growth over the next five years will continue to be dominated by offerings from the major OEM players," wrote Juniper's Nitin Bhas. "Additionally, we now have the likes of Huawei Pay and Fitbit Pay launching in several markets; this is now included in Juniper's contactless forecasts." Fitbit Pay rolled out with the Ionic smartwatch last year, and has so far been limited to that and the Versa. Google Pay is supported by many more devices, even with the fragmentation of Android. 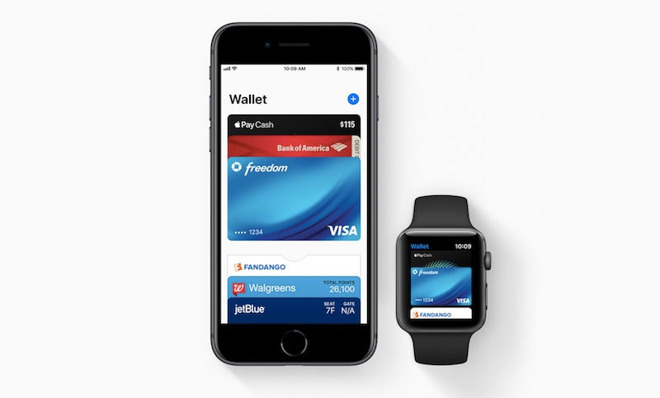 Apple Pay has been supported on iPhones and iPads since 2014, the Apple Watch since 2015, and Macs since the introduction of Apple Pay on the Web. Touch Bar-equipped MacBook Pros can use Apple Pay without a companion device. Looking again at its 2020 target, Juniper suggests that OEM pay systems will top $300 billion in transactions, accounting for 15 percent of all contactless in-store payments. Apple Pay is continuing to evolve, for instance through the introduction of PayPal-like Apple Pay Cash transfers and the switch from Touch ID to Face ID on the iPhone X. More devices are likely to adopt Face ID, such as upcoming iPhones and iPads.